Can there be anything new in scientifiction? We say yes — and offer CAPTAIN FUTURE. Fellows, CAPTAIN FUTURE is tops in scientifantasy! A brand new book-length magazine novel devoted exclusively to a star-studded quartet of the most glamorous characters in the Universe. And the most colorful planeteer in the Solar System to lead them – CAPTAIN FUTURE. You’ll find Captain Future the man of Tomorrow! His adventures will appear in each & every issue of the magazine that bears his name. He ought to be good. We spent months planning the character, breathing the fire of life into him. For we feel that the man who controls the destinies of nine planets has to be good. But don’t take our word for it — get your first copy of CAPTAIN FUTURE the day it hits the newstands and marvel at the wizard of science as he does his stuff on every thrilling page. You’ll find Captain Future the most dynamic space-farer the cosmos has ever seen. A super-man who uses the forces of super-science so that you will believe in them. You’ll see Captain Future’s space craft, the Comet spurting thru the ether with such hurricane fury you’ll think Edmond Hamilton, the author, has hurled you on a comet’s tail. And you’ll agree that Captain Future’s inhuman cavalcade — the Futuremen — supplement the world’s seven wonders. There’s Grag, the metal robot; Otho, the synthetic android; and Simon Wright, the living brain. A galaxy of the ultimate immortal forces! So come on….give the most scintillating magazine ever to appear on the scientifiction horizon the once over. You’ll be telling us, as we tell you now, that CAPTAIN FUTURE represents fantasy at it’s unbeatable best. CAPTAIN FUTURE will appear at all newsstands in a few weeks. Price, 15 cents. 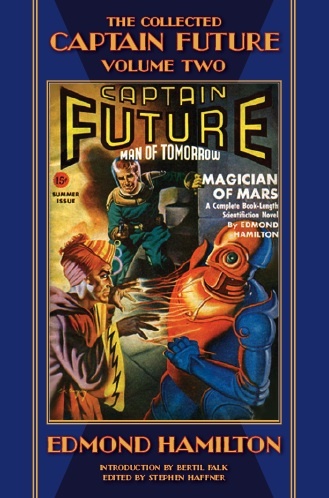 First issue features Edmond Hamilton’s novel,CAPTAIN FUTURE AND THE SPACE EMPEROR. Cover by Rozen. Illustrations by Wesso. Short stories by Eric Frank Russell and O. Sarri. Brand new departments – THE WORLDS OF TOMORROW, THE FUTUREMEN, UNDER OBSERVATION, andTHE MARCH OF SCIENCE. "The Future of Captain Future"